The “Great She Bible” was one of the first two editions issued for the authorized King James Bible of 1611. Now a new edition has been found. It may be one of the oldest cases of he said/she said. Literally. The “Great She Bible” was one of the first two editions issued for the Authorized King James Bible of 1611. A simple typo – and four centuries – has made the “she” version of the holy book more vaunted than the first edition dubbed the “He Bible”. Now, in a small Lancashire church, a newly identified extant edition of the text has been found. The recently found “Great She Bible” was uncovered by Reverend Anderson Jeremiah and the Reverend Alexander Baker in St Mary’s Parish Church. They came upon the large tome while exploring the medieval church to which they’d been assigned. Dedicated in 1135, St. Mary’s inventory mentioned an “old Bible,” but did not further elaborate on the relic in question. Thus the “She Bible” manuscript unknowingly in their possession had not been seriously scrutinized until recently – after being rediscovered in a back cupboard. Why is this Bible so Different & Important? So why is this holy book called a “She Bible”? The disputed she/he verse takes place in the Old Testament’s Book of Ruth. In chapter three, Ruth, now widowed, seeks her new husband, a relative named Boaz. In this chapter he accepts his familial responsibility and gave Ruth “six measure of barley” – a very generous amount given the famine at the time – to provide for her and her mother-in-law. Now comes the literary fisticuffs. The first KJV edition commissioned by the eponymous King James I of England/King James V of Scotland in 1611 states, in verse fifteen: “he went into the citie” after the gift of barley. Conversely the subsequent edition, like the Lancashire “She Bible” manuscript, states that same verse as, “she went into the citie”. Most scholars agree that “she” version is the contextually appropriate pronoun for the verse in question. 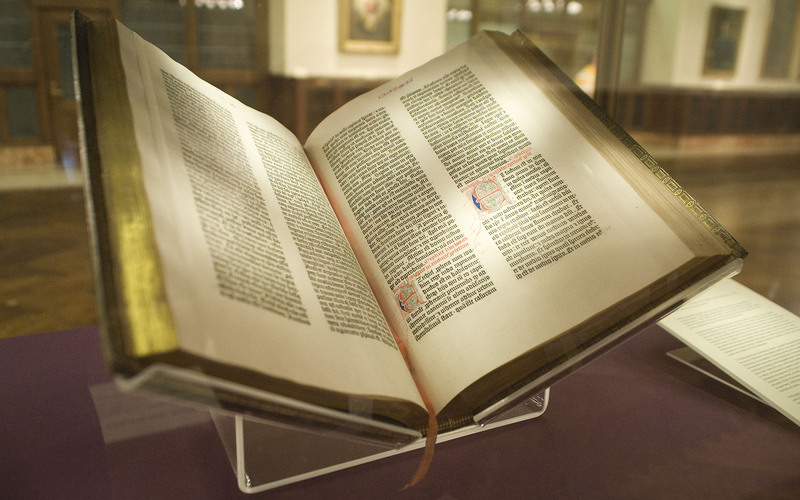 The second “She Bible” version was to correct the initial “He Bible” manuscript. This newest find brings the total extant “She Bible” copies to six. The other five are located at Oxford and Cambridge universities. As well as Salisbury, Exeter and Durham cathedrals, respectfully. Close-up of the opening page of the New Testament in St. Mary’s “Great She Bible”. Read more about the find at the BBC and at the Lancashire Evening Post.